Reflections and Ruminations: Who fights against God? Just about every one of us. 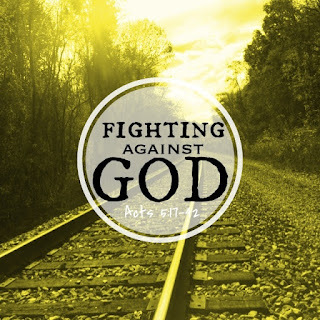 Who fights against God? Just about every one of us. The Pharisee Gamaliel is featured in chapter 5 of the Acts of the Apostles. He addresses the gathered Sanhedrin and offers them sound advice regarding the way that the apostles should be treated as the early Christian movement starts to gain momentum. In closing, he says that if the movement is indeed from God, that they will find themselves not only unable to destroy them, but that they might find themselves fighting against God. A rich meditation resulted from this passage which I thought might be fodder for this week’s blog entry. If we think about it seriously, all our encounters with sin and how it results in our being torn and divided from within when we find our conscience bothered and unsettled is because we have been fighting with God. We hardly fight the devil when it comes to sin. In fact we work with and collaborate with him. When mired in sin, it who we are actually fighting with is God, and this is nothing new. Right from the start when our first parents sinned, they fought against God and his divine will. From that point on, humankind (with the exception of Jesus, Mary and perhaps John the Baptist) has been in on this fight in large and small ways, and the more combative and ornery ones amongst us seem to have risen to WWF standards in this fight. I am of the opinion that the start of any spiritual awakening is when one is aware of this ‘fight’ that is going on in each of us, and we see the pointlessness of it. True inroads to spiritual maturity are marked by the turning points in our lives where we make the conscious choices to want to live in grace and no longer find the lures of sin irresistible the way they were before. The rich history of the Church’s saints and martyrs are redolent with true stories of how this fight was not only identified, but when it was arrested altogether. They have chosen to fight not against God, but against evil and sin, and this has caused them to be marked as heroes of our faith. What made them so resolute? Those who are without religion would tend to say that they were brainwashed. And some would say that the worst thing about religion is that people are driven to seek God out of fear and desperation. Truth be told, anything that is done out of a motive of fear usually never turns out with a good result. Stories abound of marriages which have been entered into because of fear, causing all sorts of marital issues to surface later on. Fear, the antithesis to love, will always be wary of freedom. Love, on the other hand, is only true and godly when it is celebrated in freedom, and returned in freedom. There are basically two ways in which one can cause another to run. One can chase another and fill him with fear, and make him run away from something that poses a threat. Which of us has not heard about those preachers from past generations who instilled the fear of hell into the hearts of the parishioners? Their intentions were noble in that they truly wanted their flock to love God. While the most charitable part of me chooses to believe that they had good motivations, I find it hard to believe that they truly worked. One who is cowed into loving or doing loving acts will resent it at some point. The other way that we can cause others to run is to give them a goal and a purpose to run toward. What is sought after is always ahead and the future, when it is reached, is a sweet ending that one only gets a small taste of while on the way there. The quality of one’s motivation and purpose then becomes much more positive on many levels, and the inspiration to go the distance comes from within. Any effective leader has to nurture this in order to bring out the best from those under his charge, and this applies to schoolteachers, company department heads, parents as well as to priests and teachers of the faith. In our quest for spiritual greatness, much as we choose our battles, we also choose how we are running. Over the weekend in my parish, some of you may have noticed that I was walking with the aid of a cane. My quick (but harmless) reply to why I was using this was that it was stylish. But if you truly know me, you would know that I do not do anything simply because of style. Lately, I experienced a nagging pain in my knees, especially after I returned from a run outdoors. Following my doctor’s recommendation, I went for an MRI of my knee, and I must admit that I was not quite prepared for the result that ensued. It reveals that I am now a sufferer of what is known as Osteonecrosis. Caused by a marked reduced blood flow to the bones, necrotic bones start to die and can break down altogether. The scan reveals that I have it in my knees and hips, and there is usually no reversal of this condition. One lives in a different way when one lives with osteonecrosis. Apparently this was caused by my high doses of steroids that I took when my encounter with Leukemia began, and it is not uncommon to find osteonecrosis in patients who have had my illness. How is my life changed? Quite significantly. I can no longer run (something which I loved to do), I should not be kneeling and putting weight on my knees in any compromised position (a priest who doesn’t kneel? Come on! ), squatting and jumping are going to stress my joints and the most challenging one for me as a priest is that I should not be standing for periods longer than 30 mins at a time. These interdicts should be adhered to as closely as possible in order for me to prevent any collapse of my skeleton where the structure and integrity of the bones are compromised. My mobility may be limited, but it doesn’t mean that I am paralyzed either. Life continues, but in a different way, and I believe that new challenges need to be broached with new attitudes. It is interesting to see that it is at a time when it appears that progress is making headway that speed bumps appear on the horizon. I choose to see these as God’s invitation to me to offer up more of myself for souls who are suffering. He is constantly drawing us to take up our crosses to follow him. I cannot be alone as one who has been given additional crosses in my journey as a disciple of the Lord. My readers must have theirs as well, and if I am being used by God to be a source of inspiration to them, I will be most happy to. So, the next time you see me with a walking cane in my hand, and perhaps walking with a slight limp, do know that it’s ok. I’m still hobbling my way slowly to the Kingdom of heaven. And I believe we’ll all run like the wind there. Dear Fr Luke, though you would probably not want me to say this, I am sad to hear about your latest affliction. I am lost for words except that your sharing on how you are taking this immediately reminded me of - 2 Cor 4: 8 We are afflicted in every way, but not crushed; perplexed, but not driven to despair; 9 persecuted, but not forsaken; struck down, but not destroyed; 10 always carrying in the body the death of Jesus, so that the life of Jesus may also be made visible in our bodies. 11 For while we live, we are always being given up to death for Jesus’ sake, so that the life of Jesus may be made visible in our mortal flesh. Your life testimony has and will always be an inspiration to me and I am sure scores of other Christians. Fr Luke, you are a true inspiration and my own crosses seem light versus those that you have to bear. My prayers and those of many friends are with you. I thank you for sharing yourself through your blog. For example, "It is interesting to see that it is at a time when it appears that progress is making headway that speed bumps appear on the horizon. I choose to see these as God’s invitation to me to offer up more of myself for souls who are suffering. He is constantly drawing us to take up our crosses to follow him." I am struck by your positivity and your faith in God. I share similar sentiments as you in that "when it appears that progress is making headway that speed bumps appear on the horizon." How often have I lament about my bumpy situation(s) that appear especially after some progress was made in previous situations. Each year, something major happens in my life and I find myself being angry with God and questioning him "Why is this happening to me? What else is next?" I don't have that "Bring it on, man!" mentality. Reading your blog has caused me to pause and reflect on my own journey of sufferings and the course of action that I can take as a Christian, ie. to offer up my sufferings for those who are suffering, to take up my crosses and follow Christ. I still can't say that I will be positive in welcoming adversities in life but at least your sharing has helped me see how I can be a better Christian in my adversities. Thank you, Father and enjoy your well-deserved vacation! May you come back recharged and rejuvenated. I will miss your blog and sermon though as they have become my regular weekly spiritual food.